In the previous two articles the Marquis 25 and Nearly No-Brainers were selected, accounting for nearly one-half of the Top 100 Collectible American Picturebooks. While the selections included several Caldecott Medal books, the award itself was not the crucial ingredient – other factors contributed to the book’s inclusion. Given the weighty importance of the Caldecott Medal within the collectible picturebook genre, a low risk strategy is to add key Caldecott Medal books to the Top 100 list. Some might have started their list of Top 100 Collectible American Picturebooks with the complete list of the seventy-odd Caldecott Medal winners, then supplemented the list with other key picturebooks. Undeniably this is a viable strategy. I’ve taken another tact, building most of the list without the first edition Caldecott books as the centerpiece. It will be interesting to see the Caldecott’s impact once the entire list is completed. I’ve selected twelve key Caldecott Medal books to add to the Top 100. 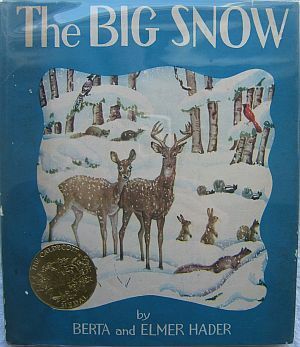 In most instances the books won the only Caldecott Medal award for a commercially successful children’s book illustrator. The selections are a mix of illustrators who won the award at the dawn of their career, and illustrators who won the award toward the dusk of their career. For the former, it begs the question: Was winning the reason for their subsequent success? For the latter: Was their prior success the reason for winning? Consider these questions while reviewing the list. The following provides a single line summary of the rationale for the book’s selection, along with the estimated market price. The market price is for the first edition book with the corresponding first edition dust jacket, both in Very Good or VG+ condition. The list is sorted in chronological order. In reflection, rather than focussing on the title, read through the list of twelve illustrators in the above list. From Slobodkin to Wiesner, top-to-bottom, an impressive group of illustrators! Many Moons (1943) was the first picturebook illustrated by Louis Slobodkin. He illustrated over 70 books during a career spanning three decades. Authored by James Thurber, the well loved humorist, enhances the collectibility of the book. 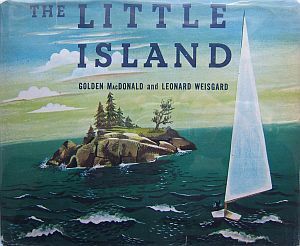 The Little Island (1946) was Leonard Weisgard’s only Caldecott Medal. The book’s collectibility is enhanced by Margaret Wise Brown’s authorship, under her Golden MacDonald pseudonym. Lynd Ward was a prestigious woodcut artist prior to winning the Caldecott Medal for The Biggest Bear (1952). He is one of the few illustrators who moved seamlessly between the juvenile and adult markets, and is regarded with highly in both sectors. Marcia Brown had won seven Caldecott Honors before winning her first Caldecott Medal award for Cinderella (1954). Brown later won two more Caldecott Medal awards, Once A Mouse (1961) and Shadow (1982). William Steig is best known for his book, Shrek! (1990) which has been turned into a pop culture icon. A reknowned cartoonist, Sylvester And The Magic Pebble was Steig’s only Caldecott Medal. Steig won two Newbery Honor awards for Abel’s Island (1976) and Dr. DeSoto (1982); impressive, as it is unusual for a picturebook to win an award for its story. Tuesday (1991) is the first of three Caldecott Medal awards won by David Wiesner, and much more difficult to come by then The Three Pigs (2001) and Flotsam (2006). Wiesner won Caldecott Honor awards for Free Fall (1988) and Sector 7 (1999). Three Medals and two Honors, first edition of Wiesner’s early books are going to increase in collectibility. Wiesner has redefined the wordless book; his work is truly remarkable. Referring to the original article in this series, I rated each book across eight different, but related factors. The chart, above, provides a single line summary of the rational for the book’s selection of the Key Caldecott Medal Books, a simple topline synthesis of the ratings. The illustrated children’s picturebooks that win awards, by definition, are of the highest caliber. In nearly all cases, the winning book will be increasingly sought after by readers, selling more copies and staying in print longer than otherwise. Because of this increased demand and exposure for the particular book, the collectibility and value of first edition copies are enhanced. Currently only the Caldecott Medal & Honor award winning books make a significant impact on a book’s collectibility. So rather than rate the Awards factor 1-to-10, I simply input whether the book won a Caldecott Medal or Honor. Eventually this might change as more collectors enter the market, the first edition Caldecotts get absorbed into public and private collections, causing collectors to expand into other areas. Why Are Caldecott Award Books So Collectible? Since 1938, the Caldecott has been awarded annually by the American Library Association. The ALA is a highly regarded organization, originally chartered in 1879, currently serving 150,000 librarians working at 110,000 libraries. A sub-group of the ALA, the Association for Library Service to Children (ALSC) is reponsible for the selection process for the Caldecott awards. A committee is appointed each year by the ALSC. The nomination of books for consideration is formalized, as is the selection and award process. This highly structured organization along with a credible and structured nomination and selection process gives great credibility to the Caldecott awards. In and of itself, this should be sufficient to warrant a high collectibility for the first edition award books. But there is more. The ALA/ALSC selects the Caldecott award books and is the same group responsible for selecting books carried in our public libraries, including elementary school libraries. Because of this, it is a foregone conclusion Caldecott award books will be carried by most public libraries across the country, therefore being front and center in the book recommendations librarians and elementary school teachers make to their students. This fuels the out-of-school purchases by parents for the home library – their children will gravitate toward books they have seen and read in school. The cycle nearly guarantees the books stay in print for a long time. Because of this, the Caldecott award books are read by children from generation to generation. Millions of people, perhaps tens of millions, are exposed to the books as children. As these children become adults, a small portion might want the nostalgia of owning the first edition of books from their youth. The Caldecott award books are some of the most familiar books from an adult’s childhood. This familiarity breeds desirability, and the collectibility of the book is enhanced. As more people come to understand that first edition Caldecotts have value, in some cases very high value, more people will want to own these memorable gems from their childhood. The next article in the series will continue to build the list of Top 100 Collectible American Picturebooks.